Friday, October 9 1908 -- After a draw and victory over Leonard Lauder in two back-to-back fights, Harry Trendell has worked his way up the ladder to Freddie Welsh. Welsh and Trendell will fight tonight at Naud Junction, and Trendell will turn out to be badly overmatched. Welsh will knock him out in the 6th round. Also another vignette about Bill Desmond's 'around the world' trip. Alexander Wilson “Alex” Kurfiss was born in Kansas City, Missouri, on November 16, 1900. His full name and birth information were found in a family tree at Ancestry.com. According to the book, Christopher Reynolds and His Descendants (1959), Kurfiss’s parents were Shelby Harney Kurfiss and Addie Brown Smith. Student Kurfiss and his architect father were listed in the 1909 Kansas City, Missouri city directory. Their home address was 2114 Amie. Kurfiss had the same address in the 1910 U.S. Federal Census. He was two years older than his sister, Virginia. Kurfiss attended Northeast High School and was in the class of 1918. A photograph of him was found the 1916 school yearbook, The Nor’easter. The family tree said Kurfiss attended Kansas City Art Institute in 1918. The following year Kurfiss was a student at the University of Kansas. The 1918 Kansas City, Missouri city directory said the Kurfiss family resided at 320 North Chelsea Avenue. They were at the same location in the 1920 census. Cartoonists—Animators wanted for moving picture cartooning; experienced or inexperienced. Apply in person. Laugh-o-Gram Films, Inc., 1127 E. 31st st. In the book, Walt Before Mickey: Disney’s Early Years, 1919–1928 (2011), Kurfiss’s role at Disney was described by Rudy Ising who said Kurfiss was “a successful commercial artist, but [at Laugh-O-gram] did mostly the posters; we used to make a poster for each one [of the shorts].” Kurfiss’s printed signature was on the Laugh-O-gram Little Red Riding Hood poster. The 1924 city directory said Kurfiss was an artist at the Kansas City Star. His occupation was artist in the 1925 directory. The 1927 listing had Kurfiss as an architect at the firm W. E. Gillham. In all three directories, his address was 320 North Chelsea Avenue. Ser. No. 256,493. Standard Publishing Company, Chicago, Ill. Particular description of goods. — Fashion Strip and Cartoon Published in the Form of a Mat to be Used in Newspapers for Advertising Purposes. Claims use since Sept. 5, 1927. The Connoisseur ran in the Philadelphia Ledger from November 21, 1927 to December 8, 1928. 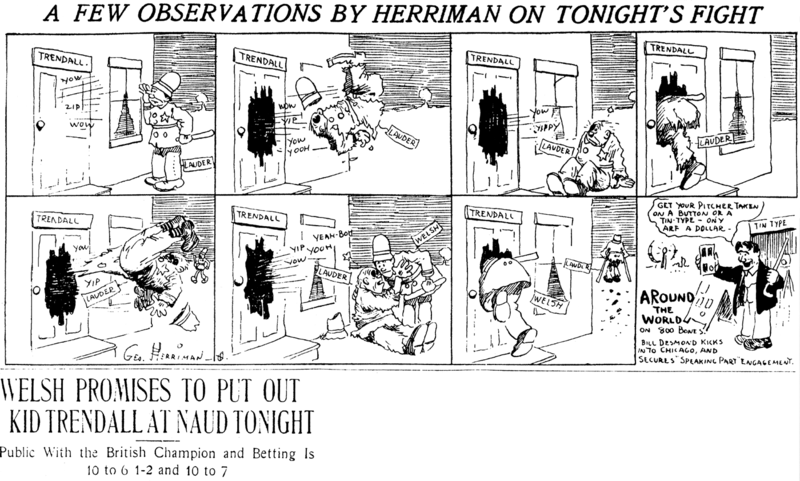 The strip also appeared in the Greensboro Daily News (North Carolina) in 1928. Kurfiss’s marital status was divorced in the 1930 census. He continued to live with his parents. At some point, he moved to Chicago. According to the Christopher Reynolds book, Kurfiss’s first wife was Fleda Wamsley. They married around 1923. The 1930 census recorded Wamsley and her six-year-old son, Robert Kurfiss, at 429 Tenth Place in Kansas City, Missouri, which was the home of her parents. The family tree said Kurfiss graduated from the Chicago Art Institute around 1935. Kurfiss was in Chicago during the 1940 census. He resided at 838 Dearborn Street and was a commercial artist. Later that year Kurfiss married Margery Maud Knapp. Their unnamed son was born November 9, 1948 and did not survive. The Catalog of Copyright Entries, Third Series, Volume 28, Parts 7–11A, Number 1, Works of Art, Etc., January–June 1974 recorded Kurfiss’s drawing. To trisect an angle. With semi-circles & arcs. By Alex Kurfiss. Mechanical drawing. © Alex Kurfiss; 31Oct74; IU17077. According to Walt Before Mickey, “the couple retired to Marjorie’s native Iowa…” Kurfiss passed away December 29, 1983, in Westfield, Iowa. One of the odder comic strips you'll ever encounter is The Connoisseur. The oddnesses just pile on, one after another, until you have an amazing skyscraper tower of weirdness. First of all, the basic idea of a comic strip devoted to fashion advice is a bit screwy. What's wrong with text and photos? Why a comic strip? Is there a worry that the illiterate aren't getting the latest word in hem lengths? Do preschoolers have a yen to know whether herringbone or houndstooth is in this year? Secondly, our comic strip host Mr. Van Der View seems to be a rather creepy old man. He can't manage to keep his concentration to write a check in a bank when some shapely female wrists are visible. Geez. A revealing dress I could get. But getting the cold sweats over a bracelet? Then again, I suppose he might not seem QUITE as creepy if his head wasn't shaped like a bewhiskered Pac-Man. But it is. Why, oh why? Lucky for the old creep, he's apparently loaded. So he has no trouble keeping the shapely young ladies, the ones with dollar signs in their eyes, hanging around. Even when all he wants to do is ogle them and then criticize their clothes. So if all that wasn't bad enough, The Connoisseur indulges itself with one final coup de grace. They tell their creepy little fashion stories in verse. Oh, c'mon. All that weirdness plus tortured doggerel, too? Now you're just messing with us. The bizarre train wreck that was The Connoisseur actually had a more substantial run than the week or two you might have guessed. It ran from August 29 1927 to December 8 1928. On the other hand, you won't be at all surprised to find that the creator(s) declined to take any credit on the strip, ever. Even the syndicate tried to hide itself. 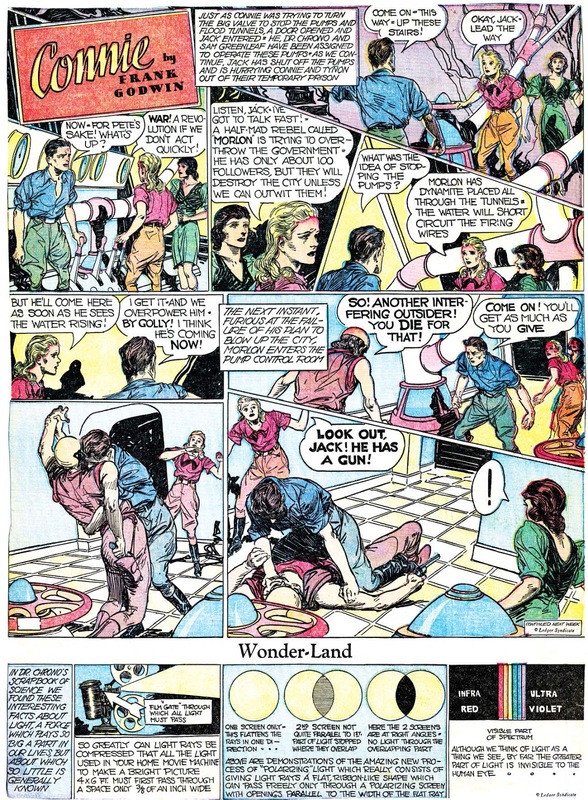 Though Bell Syndicate was the distributor, the copyright slug on the strips is to some firm called Standard Publishing. Why I dunno. According to an anonymous online dealer from whom I bought some original art to this strip (no, really, I did), he got it on good authority that the artist was a fellow named Alex Kurfiss. And not in the ladies at all. Me thinks he is a cross dresser. Franklin Osborne Alexander was born in St. Louis, Missouri, on November 3, 1897, according to the Syracuse University Libraries and Contemporary Authors (1978). Osborne was his mother’s madden name. The 1900 U.S. Federal Census recorded Alexander as the son of Frank and Blanche. They resided in Meriden, Connecticut at 30 Hobart Street. His father was a clerk at a manufacturing company. Ten years later, the census said the family lived in Evanston, Illinois at 1219 Oak Avenue. Alexander’s father was a manager at a lamp company. According to Contemporary Authors, Alexander attended Northwestern University during the years 1916 to 1917, and 1919 to 1920. Syracuse University Libraries said Alexander studied at the School of the Art Institute in Chicago, and during World War I, he was with the Camouflage Engineers in the American Expeditionary Forces. © May 6, 1922; 2 c. and aff. May 24, 1922; A 676444. American Newspaper Comics (2012) said Alexander’s first strip* was Finney of the Force that ran under his name from July 1925 to 1931. The strip was continued by Ted O’Loughlin. Alexander drew L. Franklin Van Zelm’s The Featherheads from December 1926 to 1931; Alexander signed the strip with his middle name, Osborne. At some point, Alexander moved to Oklahoma. His name and occupation, artist, were listed in the 1929 Oklahoma City city directory. The 1930 census said Alexander, his wife and two children resided at 2709 West 17 Street, Oklahoma City. The 1930 and 1931 city directories said Alexander was a cartoonist. 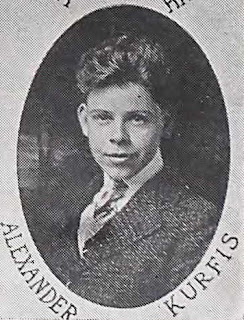 In 1931, Alexander moved to Cheltenham, Pennsylvania. He took over Charles W. Kahles’s Hairbreadth Harry which was distributed by the Ledger Syndicate. According to American Newspaper Comics, Alexander was on the strip from March 30, 1931 to February 5, 1939. Alexander created the strip’s topper, High-Gear Homer, which started November 8, 1931 and ended July 30, 1939. Alexander didn’t expect to make any money from his drawings. In fact, feeling that he was making only a trivial contribution to the game, he didn’t even sign his name to his work, making it difficult to discern years later his contributions from those of another overlooked graphic designer. Pilon said it’s unclear if Alexander created Mr. Monopoly; she said many believe the creator was Dan Fox. Pilon has an article about Lizzie Magie, the creator of Monopoly, in The Smithsonian, January 2015. The 1940 census listed Alexander and his family at 1204 Stratford Avenue in Cheltenham. He was a freelance cartoonist who had two years of college education. Syracuse University Libraries said Alexander drew editorial cartoons for the United Features Syndicate. Then, in December 1941, Alexander joined the Philadelphia Evening Bulletin, where he was staff cartoonist until his retirement in 1967. That same year Darrow died. When a top cartoonist dozes off, what does he dream? F. O. Alexander dreams his own version of Bunyan’s Pilgrim’s Progress. He satirizes human frailties through the experiences of Joe Doakes, the average man who suffers the evils of the world with patience, humor, hope, and considerable grumbling. Like Christian in Bunyan’s story, Joe Doakes embarks on an adventure. He meets the contemporary problems of cynicism, apathy, materialism, and bigotry—and even wrestles with a dragon along the way. Contemporary Authors said Alexander’s address, in 1978, was Beaver Hill Apartments, No. 328, Jenkintown, Pennsylvania. Alexander passed away January 17, 1993, according to the Social Security Death Index which said his last residence was Philadelphia, Pennsylvania. After a few false starts on the syndicate train in the early 1920s, F.O. Alexander got a more satisfying ride at Western Newspaper Union starting in 1925. WNU was a syndicate that specialized in supplying content to small rural papers, mostly weeklies. They had begun offering a few cartoon items in the late 1910s, and in the 1920s they slowly began to expand on those offerings. In July 1925 they began offering Alexander's Finney of the Force, a whimsical strip about a sweet-tempered Irish cop. Finney's beat was a predominantly Irish neighborhood, and most of the cast speaks in dialect. Sometimes that dialect, at least in the way Alexander writes it, can be a wee bit impenetrable, but the occasional lapse in understanding rarely gets in the way of the gentle humor. Although Finney did actually fight serious crime on occasion, Alexander generally kept the tone very light. Sometime in 1926, probably late in the year, WNU tried offering the strip as both a daily and a weekly. The daily version is very hard to come by, but seems to have lasted until about 1929 before the experiment was scrapped. As best I can tell, Alexander inserted some light continuities in the daily, and typically saved a standalone gag strip for the weekly version. In 1931, Alexander was offered the gig of continuing Hairbreadth Harry for Ledger Syndicate after the death of Charles W. Kahles. While Hairbreadth Harry was not exactly a major A-list property in 1931, it certainly was running in more major city papers than Finney of the Force did, or could ever hope to given its syndicate. Alexander jumped at the chance. Although Alexander's name was penned onto the Finney strips until November 1931, for several months before that the art had slowly but surely taken on a new look. The new artist, who would not be given credit until April 1932, was Ted O'Laughlin. His version of Finney was a little more mundane, a little less sprightly, than Alexander's. Finney's grump of a wife was now featured more often, and the strip began to read like The Bungle Family in strips where Finney was at home. 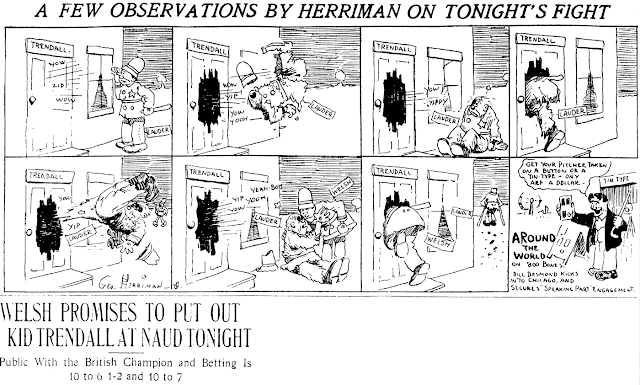 Although Ted O'Laughlin would be credited on the strip until its end in July 1938, the art goes through at least one if not more stylistic changes that would seem to indicate that other hands were stirring the pot during those years.